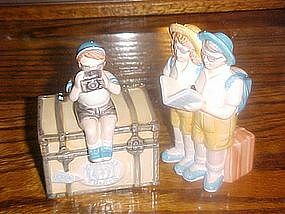 A most unusual set of creamer & sugar for the collector.The set consists of the creamer being two tourists reading a tour guide decked out with backpacks,sunglasses, bermuda shorts and their sensible shoes. The guide book is the spout of the creamer, and the covered sugar is a little boy sitting on a big trunk taking pictures. Made by Applause. Creamer measures 5 1/4" tall. Made of hand painted glazed ceramic. Both are in pristine condition.